You may have worked with other commercial photographers in the past. Or, you may not have and you have no idea what to expect. 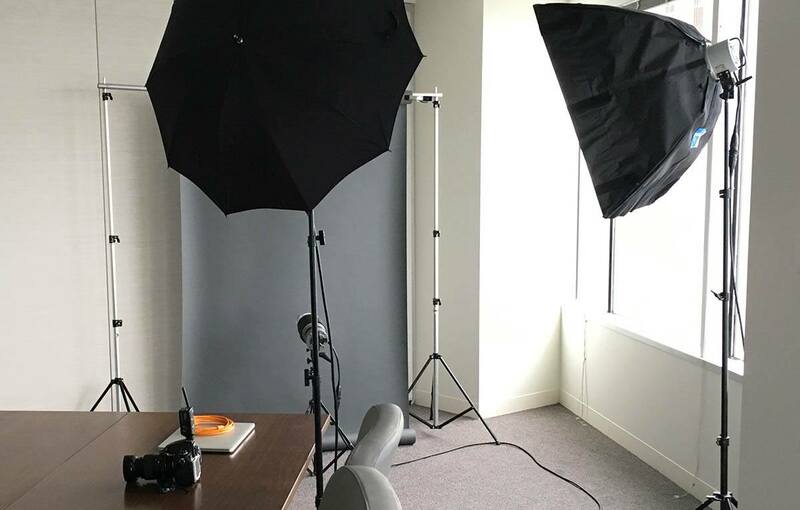 Either way, this article will outline what to expect if you hire FayFoto Boston for a business portrait, or “headshot” assignment. The first half of this article deals specifically with sessions conducted in your office. The second half applies equally to location assignments and sessions in our Brighton studio. The former is more convenient for your personnel. The latter is more economical. If you have any doubts as to whether to send your people to us or ask us to come to you, please get in touch. Outline your needs, and ask us for a quote. If your needs require environmental style portraits in your office’s specific setting, it’s obvious we need to come to you. If you have multiple people lined up for a session, the cost difference between our studio and your office tends to even out. And if your subjects are on tight schedules, traveling to our studio may be prohibitive. We always bring studio lighting equipment and professional digital camera equipment. We generally bring a charcoal-gray background unless the portrait specification calls for an environmental setting or a different color background. And as a rule we have our camera connected to a laptop computer so the subject can see what’s happening. See below for more information on this. There aren’t general rules on this, other than to say that a private office is probably going to be too tight. We do need a space with width for our lights and some depth. A 15’ x 15’ working area is comfortable. We sometimes find ourselves in conference rooms which appear spacious, but which are dominated by a massive, immovable table! Although we are an adaptable bunch, the settings which generally work best tend to have furniture we can move, such as training rooms or break rooms. We need 20-30 minutes to set up, and the same to pack up. Please keep this in mind when reserving a conference room. The following information applies whether we work in your office our our studio. We take good photos to begin with, but everyone looks better with a little attention. We might take 15-20 images per person, but we’re only going to optimize one or two. So how do we know which image(s) to optimize? Currently there are three approaches. If time permits, the most efficient approach is to ask each subject to make a selection at the sitting. We capture images directly to a laptop computer. We review the options with the subject immediately. If he or she dislikes them all, we take more, until a winner is identified (within reason of course; 12-18 images seems to be about average). It’s honestly quite amazing how well this works, and it’s a huge time saver for our contacts who no longer have to chase down subjects and get a selection afterwards. Asking subjects to make a selection at the time of the sitting does, however, take about 10 minutes per person, so please keep that in mind when scheduling. If time doesn’t permit asking subjects to select on the spot, or if the marketing team wants input in the selection, we can post a temporary gallery of options online. All involved parties can review options and later send us the selection for post production. The gallery is deleted once we have a selection. Similar to the web photo gallery option, a selection of images can be made into a PDF document for review. Work in our studio after the selections have been made transforms a good capture into an amazing portrait. As mentioned earlier, everyone looks a little better with some attention. We hesitate to use the term retouch (which makes most executives uncomfortable). Instead, we prefer to use the terms “clean-up”, or “polish,” which suggests that we are making something which is already good even better. Read more about our approach to portrait retouching here. FayFoto Boston makes sure every selected image is polished before delivery. Our post production team use a light touch, but you may be assured that every portrait is looked at closely. We make sure skin is evened out, blemishes are eliminated, shine is subdued, fly-away hair is managed, teeth are whitened, and eyes are brightened. If we don’t have any file size specifications, our default is 4” x 6” at 300 dpi. We have found this to be large enough for most print needs and small enough to be easy to distribute. However, if you do provide us with exact specifications (inches wide by inches high for print; pixels wide by pixels high for websites) we are more than happy to provide that. Some of our clients find our default works fine. Other clients provide very tight specifications (which sometimes involves as many as 3-5 variations per subject, with custom file names). We keep careful, detailed records for each of our clients. You can count on consistent results if you let us know what you need. Final images can be delivered as an email attachment if there are only a few and the file sizes aren’t too large. If there are lots of images, or if each image is quite large, we will compress them into a .zip archive, upload the .zip file to our server, and send you a download link. We find that most of our corporate clients can’t receive a .zip archive as an email attachment, but have no problems downloading the same .zip archive via a link! An optical disk (CD or DVD) is still an option. We can deliver a physical disk by postal mail, or by FedEx. FayFoto Boston provides what you need. We are flexible and efficient. We won’t waste your time. We don’t offer arbitrary packages. We listen to what you need, and we provide you with that.